WarZone is an excellent tower defense game from Jeff Gold. It is combination of maze and standard tower defense games. Machine Gun is fast basic weapon with average range and low damage, suitable against all types of enemies. Cannon is an weapon with average range and damage, suitable against ground enemies. 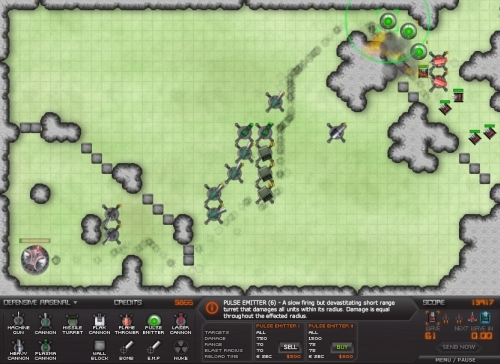 Missile Turet attacks air enemies in an excellent range with heat seeking missiles. Flak Cannon is fast weapon weapon with good range suitable against air enemies. Flame Thrower attacks ground enemies in low range with fire. It has splash damage. Pulse Emitter has a very low range but devastating area damage. It attacks all enemies. Laser Cannon attacks all enemies with laser beam. It has low rate and unbelievable range. Heavy Cannon is slow but devastating weapon against ground enemies. Plasma Cannon is an expensive weapon with an average range but very good damage suitable against all enemies. Wall Block is suitable for closing some ways for enemies. Bomb is last aid when is your defense broken. E.M.P. slows enemies in the range. Nuke is also last time solution if you need to destroy enemies in whole area. Standard (not one time) weapons can be upgraded more times and sold. The game has standard game engine, with standard controls. It has very good graphics and sound effects. Irritating background it is possible to switch off. You can see incoming waves in wave slider at the right bottom. Playability of the game is very good. I like it, because in various maps you need to use various strategies. WarZone is very good tower defense game. It has very good playability. I am giving this game 8.5 from 10 points.